Iranian Nobel Peace Prize laureate Shirin Ebadi should be allowed to speak at a Malaysian university, Malaysia's foreign minister has reportedly said. The statement is an apparent U-turn on the part of the Malaysian government. Two days ago foreign ministry officials advised the university to withdraw the invitation to Ms Ebadi, an outspoken human rights lawyer. But now Foreign Minister Rais Yatim has told the Star daily he "would like Dr Ebadi to be invited to the forum". "Malaysia should allow the freedom of expression and criticisms at the highest level. I will go and investigate this matter," he added. 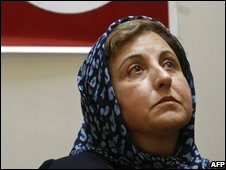 Ms Ebadi, who won the peace prize in 2003, has often found herself at odds with the Iranian government over her human rights work. Her invitation to speak on Islam and cultural diversity at the University of Malaya was withdrawn on the advice of the foreign ministry, reports said. But Mr Rais described the decision to retract the invitation as "unfortunate". He said that the advice was "not official" and said he had not been consulted. The speech was supposed to begin a series of talks in Malaysia and Thailand over the next few months. Other speakers include fellow Nobel laureate President Jose-Ramos Horta of East Timor and American activist Jesse Jackson. In her capacity as a lawyer, Ms Ebadi has defended many people accused of political and security crimes in Iran, and campaigned for greater rights for women and children. She has faced numerous death threats and hostility in the Iranian media, and the Iranian government banned her Centre for Protecting Human Rights in 2006.